125 years of banding at Belfast Temple (formerly Ballymacarrett Montpottinger) and 25 years of Downshire Brass (formed from an amalgamation of Reid Memorial Silver Band and Hillsborough Silver Band) were celebrated on 10 October 2015 as Belfast Temple Band (Bandmaster Jack Burch) joined with Downshire Brass (Musical Director Michael Alcorn), vocal soloist Megan McBride and compère Dr. Joe McKee OBE for a concert of celebration through music. The celebrations began with Belfast Temple Band playing the rousing march The Red Shield (H. C. Goffin) to march Downshire Brass to their seats. This was quickly followed by the stirring opener Hail the Dragon (Philip Sparke) from Downshire Brass. A complete change of atmosphere and mood was achieved with Lady Stewart’s Air, a flowing and calming arrangement from the pen of Peter Graham. Following opening introductions and remarks from Belfast Temple Band Sergeant Stephen Wray, the rest of the evening got under way with the professional chairmanship of Dr. Joe McKee, who enlightened the audience with facets of information, both humorous and serious, about himself and the music. The next item, the festival march Montclair Citadel (Stephen Bulla), was led by the Belfast Temple deputy bandmaster. Belfast Temple’s three cornet soloists took to the stage next to perform the trio Trumpets Wild, which received a great response from those in the hall. The atmosphere was changed again with the euphonium solo Shepherd Song (Trevor Davis), skillfully and passionately played by former Ballymacarrett MontPottinger bandsman and now Downshire Brass member Edward Wilson. Next, Queens University final year music student, and the guest vocalist for the night, Megan McBride took the stage. Appropriately, she opened with Out Here on My Own from the musical “Fame”. She received a very warm reception and captivated the audience by singing Stars and the Moon from “Songs for a New World” to end her first segment of the program. Belfast Temple Band brought a Latin American feel to the evening with El Es El Señor (Dean Jones). Downshire Brass then brought the first half to a close with their first public performance of the test piece for an upcoming contest, John Ireland’s Comedy Overture. After the interval, Belfast Temple Band brought the audience back to their seats with the big-band style item which has become somewhat of an anthem for the band, Swingtime Religion. Downshire Brass then brought one of the emotional highlights of the night, playing the popular song The Prayer (arr. Frank Bernaerts). This was immediately followed by the presentation to Belfast Temple Band of an old rope drum, circa 100 years old. 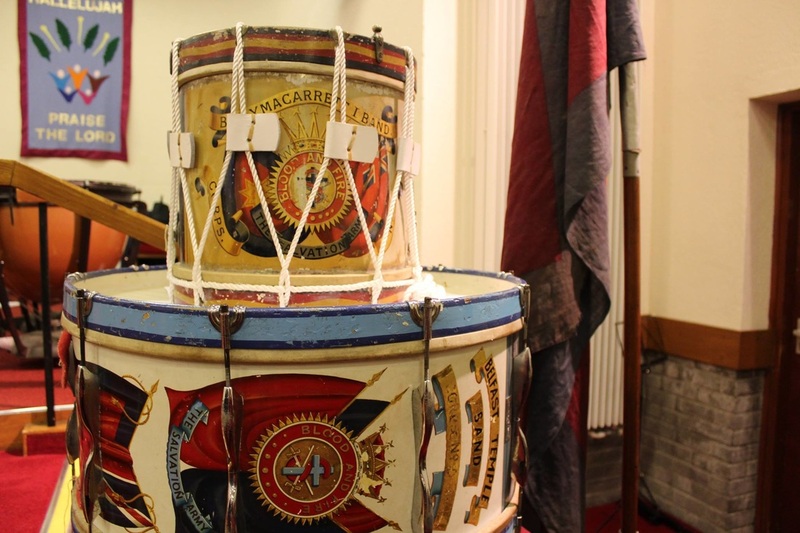 The drum had been found, in poor condition, in an attic and had been restored by the Stevenson Family in memory of their late mother, Margret. From October 1914 through the 1970s there was always a Stevenson playing the drum with Ballymacarrett Montpottinger Band. 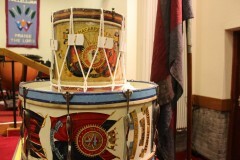 It was appropriate that the drum was presented on the band’s 125th anniversary. Following the presentation, Belfast Temple Band played their main work for the evening, Leslie Condon’s tone poem Faith Reborn. Megan McBride returned to the stage to perform I’m Not Afraid of Anything, which added some light comedy to the concert, and then finished her selections with Secret Love from “Calamity Jane”. Downshire Brass also lightened the mood with Copacabana (made famous by Barry Manilow) and You’ve Been Warned (Paul Lovatt-Cooper), which included singing from the band. The guest band’s jazz singing was followed by the Belfast Temple Band singing The Lord Is My Shepherd, bringing silence to the hall for the reading of Psalm 100 and a brief devotional thought from Band Sergeant Wray. As the two bands moved on the stage to join together for the last two items, Band Secretary Clark Mills gave some words of thanks. The concert concluded with Professor Alcorn leading the combined bands in Fire in the Blood (Paul Lovatt-Cooper) and Bandmaster Burch conducting the exuberant march Goldcrest (James Anderson), during which Downshire Brass surprised everyone by putting down their instruments to sing along with “I’ve got the joy, joy, joy, joy down in my heart” as the music concluded in joyous fashion. This article was posted in News and tagged anniversary, Belfast Temple Band, Clark Mills, concert, Downshire Brass, Edward Wilson, Jack Burch, Joe McKee, Megan McBride, Michael Alcorn, Stephen Wray on 12 January 2016 .